Tired of the same old boring Easter egg hunt you have with your kid’s year in and year out? Follow these 10 fabulous tips and spice up this annual Easter-time tradition. Use clue cards with adorable rhymes to make the hunt more exciting. Write the rhymes out on colorful cards and hide them as clues to tell kids whether they’re close to finding their treats or nowhere near them. Is there anything cuter than the Easter egg hunt being guided by the Easter Bunny himself? 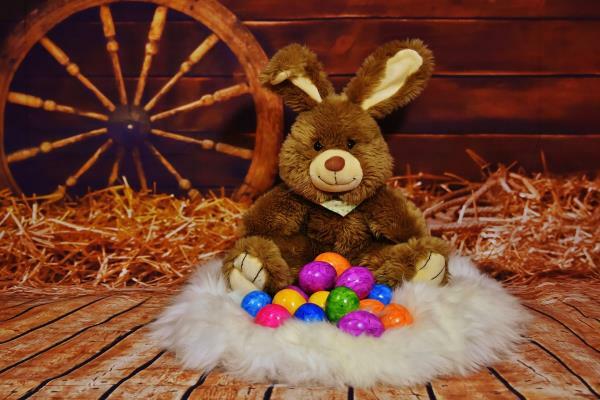 Little ones will love waking up to find that the Easter Bunny has left them a note and a few bunny tracks pointing them in the direction of the hidden eggs. To make sure that the chocolate-hungry kids don’t hurt themselves by climbing over fences for treats, establish the boundaries of your Easter egg hunt. Tell kids to stay between the house and the pool fence, for instance, or to go no further than the driveway. A clever way to make the hunt that much more exciting is to turn it into a scavenger hunt. Do this by using clues to direct the hunters from one hiding spot (and batch of eggs) to the next and ending off with a bigger prize of eggs or other surprises. With all the chocolate your kids consume at Easter consider adding some different and exciting prizes to the hunt. A colouring book or a small toy are some examples that will keep kids entertained for a little bit longer than a chocolate egg will. It’s worth making a note of how many eggs you’ve hidden and some of the sneaky spots you managed to stash them. There’s nothing worse than finding old melted Easter eggs under the couch weeks later! You can even draw a map for the kids to use to make double sure that they’ve properly cleaned out the hidden stash. If you have a large group of kids of varying ages, divide the area into zones for different age groups. For the older group, choose more challenging hiding spots, while the younger ones can enjoy an easier hunt. Another smart way to make sure that the older kids don’t bag all the treats is hiding different coloured eggs for different age groups. Colour code the eggs you hide according to age so that means the littlies hunt for a certain colour while the older kids search for another. You can even have the boys and girls hunt for different colours. Making the Easter egg challenging and engaging for the smaller kids is always difficult. Do this by adding a simple silly activity (like singing a song or doing a dance) to each egg and ask that they do it before they continue on to find the next egg. It might be singing Twinkle, Twinkle Little Star or attempting a cartwheel. How about you end off your Easter egg hunt with letting your kids destroy a chocolate-filled piñata. The piñata is also ideal for smaller kids who may not understand how to hunt for eggs yet but still want to join in on the fun.